Fried Bits 1993 was held in Bremen, Germany. It was the first Fried Bits event. The party was arranged by Channel 38, Lazer and Newline of the Ind. 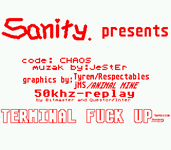 About 100 people visited the party and the really first Falcon 030 Intro were released by Chaos/Sanity. Aura and Animal Mine joined the Ind. Due to the lack of entries there were no compos held.